Dear Juergen / Benno / Tada, Greetings of the Day! I have just returned to India earlier this morning after my short visit to Thailand wherein I had the opportunity of enrolling for the OW course with Dive Asia. The feeling of having successfully completed the course is unparalleled and full credit to your team for making that happen. On this occasion, I would like to take this opportunity to thank you for all your support and guidance during my short stint with your elite team. Juergen – Thank you for all your detailed assistance during the planning stages of the course, when I had put in numerous questions that at times may have sounded very basic!! Your guidance was unconditional! Many thanks! Benno – Thank you for assisting in the last minute logistics when we decided to extend the stay. Your planning was precision timed and at no moment did we feel left out! 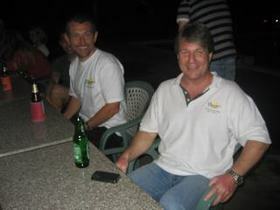 Last, but not the least……..
Tada – We couldn’t have asked for a better instructor and Divemaster! You taught us the basics in a way that it is now firmly implanted in our DNAs!! We can never forget the patient hearing that you gave us every time that we asked you questions either in the pool or in the classroom. Thanks so much for your guidance! You made us love the ocean!!! Also, a big thank you for the entire team at Dive Asia, who work tirelessly day in and day out, to ensure everything goes with clockwork precision. One thing is for sure, I will be coming back to Phuket next year…..and at every available opportunity……. 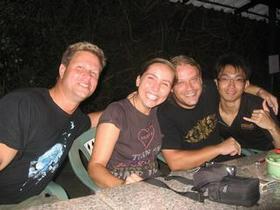 to do more courses with Dive Asia…THAT’S CERTAIN!!!!!!! Please convey my BIG THANK YOU to your entire team, and I hope to see you soon. Please do feel free to let me know if I can be of any assistance from India. In the middle of our December IDC and many days of hard study, plenty of presentations, skill practice in Pool and Open Water it was time to have a little fun; just a little….. 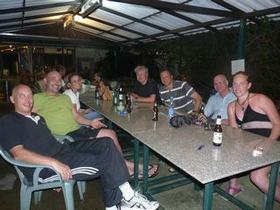 In a few days from now our Instructor Candidates will do there Instructor Examination and they have to show competence in diving theory, PADI course standards, knowledge development presentations, confined-water (pool) teaching, open-water teaching, and general diving skills and professionalism. today Dive Asia donated plenty of Toys and Bedclothes to the House of Abused Women & Children. RAWAI, PHUKET: In the latest bid to create an artificial reef in Phuket waters, an old dive boat was sunk off Koh Racha Yai on Saturday morning. The aging vessel Harruby was donated to the Department of Marine Coastal Resources (DMCR) for the project by The Racha Resort. Following a religious ceremony and speeches by a number of officials, the sinking of the 18-meter vessel began at around 1am. 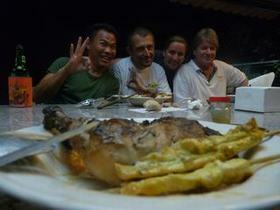 The dive boat sank in about 25 meters of water off Ao Teu, a bay at Koh Racha Yai. It took DMCR staff and volunteer divers about an hour to fully flood and sink the metal-hulled vessel. After that it took Harruby about 30 minutes to finally descend to its new home on the sea floor. Mr. Paitoon Panchaiyaphum, Director of the Phuket-based southern regional office of the Department of Marine Coastal Resources, said the project is intended to attract tourists and take pressure off natural dive sites. The steel structure is expected to be rapidly colonized by young coral, he said. Mr Paitoon said the amount of steel in the vessel put its value at about three million baht in the scrap metal market. 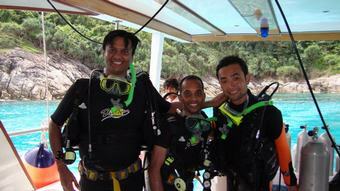 Koh Racha Yai is the single most popular site for dive instruction training in Phuket waters, he said. The Department of Marine Coastal Resources expects to sink another vessel soon to keep up with the demand, he said. 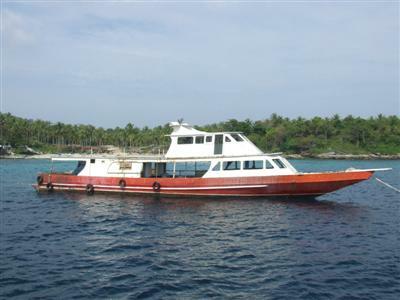 Two boats sunk in the area last year are already popular among dive tour companies, he added. Natural coral finds it difficult to grow nowadays. The cause could be related to global warming, Mr Paitoon told the media.